Parowan Adobe Fort (1851-1872) - A Mormon settler fortified town first established in 1851 as Fort Louisa named after Louisa Beaman. The fort site was located within the present day town of Parowan in Iron County, Utah. Replaced by the larger Parowan Adobe Fort completed in 1855. Probably abandoned as a fortification after the end of the Ute Black Hawk War in 1872. Parowan Fort (Wooden Version) Drawing at the Pipe Spring National Monument. Parowan Adobe Fort Marker Site. Established first as Fort Louisa in January 1851 at the founding of the town by George A. Smith. The town was established by request of Brigham Young who visited the new town in May 1851. He renamed the town Parowan, paraphrasing an Indian word for the area. Parowan was the first settlement south of Provo and was known as the “Mother Town” because many of the original settlers were called to colonize other areas in southern Utah and beyond. The original wood fort was strengthened in anticipation of Indian troubles. A threatening visit from Chief Walker and about 100 braves heightened concerns about public safety. In 1854 the Walker Indian War (1854-1855) began. The wood fort was no longer adequate and a larger adobe fort was built. During the Ute Black Hawk War (1865-1872) many of the smaller fortified communities in southern Utah were ordered abandoned and many of the residents fed to back to to the safety of the much larger Parowan Adobe Fort. Probably abandoned as a fortification after the end of the Ute Black Hawk War (1865-1872). 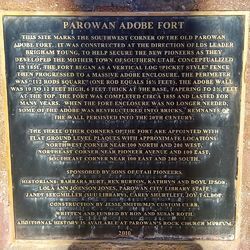 Parowan Adobe Fort Marker Text. Location: Parowan Adobe Fort, Iron County, Utah.